The Canyon Acres house I once lived in was once a mere treehouse that little by little was constructed into a real home, an enchanted treehouse on the hill. It made me wonder about other eccentricities and inhabitants that gave my old neighborhood its interesting patina. Among the people who would help me recreate a time elapsed story connecting the dots of neighborhood history, I found the common thread drawing people to the canyon was its natural beauty, its laid back atmosphere and its enclave of friendly neighbors, artists and characters. The streets on Arroyo Drive and Canyon Acres today offer a peaceful, even pastoral scene, with dogs napping in the street, the sounds of laughter from children playing, and neighbors who chat with each other. But its lineage is a link to the city’s earliest days, some of its most colorful institutions, and some of its worst natural disasters. A former brothel in Canyon Acres. Photo courtesy of Valerie Milan. My treehouse was far from the most intriguing structure in the neighborhood. My former landlords, Jason Kaufman and Lysanne Lippe, said 1575 Arroyo Drive was once a brothel called Idlehours. 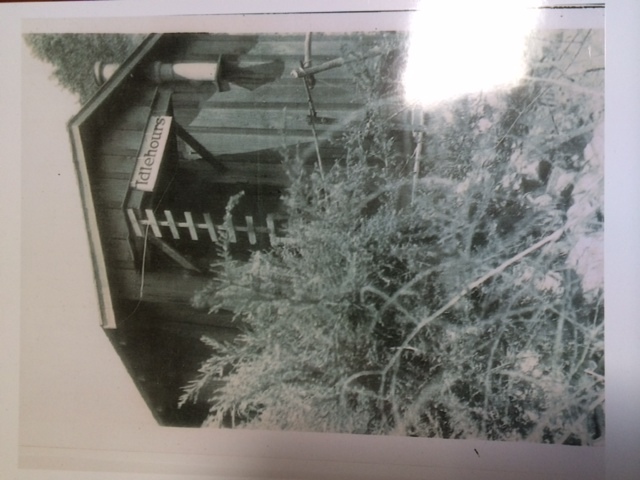 An original 1938 photo of the structure was given to Lippe by the brothel owner’s sister after she died. Artist Randy Bader moved to Arroyo Drive 20 years ago. He said hippies used bender board to put his house together in the 60s. “Back in the old days it was a beach cottage made out of planks, newspaper flour and water. It was wallpapered with newspapers from 1904,” Bader said. One neighbor whose house was built out of a chicken coop had a hard time proving the structure was a house after the 1993 fire, according to Mike and Lynn Lindsey. It was Harvey Hemenway who put the neighborhood on the map. He established the eighth homestead in Laguna Beach in 1880. Hemenway built a home in the 1890s on the southeast corner of Arroyo Drive and Canyon Acres Drive, the very edge of a 138-acre homestead. He laid claim to a second 40-acre parcel in 1895, according to a 1996 homestead map researched by amateur historian Beryl Wilson Viebeck of Lake Forest. According to “Laguna Beach, California an Illustrative Narrative History,” published in 2003 and written by resident Roger W. Jones, the Hemenway home “was later owned by ‘Old Dad’ Fisher, who covered the original house with eucalyptus logs.” Thus its moniker as the eucalyptus house. Longtime residents recall its last occupant, Maude Parkes, fondly called “Aunt Maude” by the neighborhood kids. Like many in the area, their family had been in the same home for generations. Moldenhauer’s grandparents moved to Laguna in 1942. Successive generations keep the community close-knit. Artist and naturalist Pete Ott moved to his Canyon Acres home 60 years ago. “My parents bought two 1,000-acre lots for $3,500 each,” Ott said. Many artists gravitated to the area and have remained. His late father, Peterpaul Ott, is a renowned sculptor and art professor. Ott bought the property even though the area had a tawdry reputation. Since the departure four years ago of the last descendent of the well-known Blacketer family, Ott believes his family now possesses the neighborhood’s longevity record. According to Jones’ Laguna Beach book, Lewis and Mary Blacketer came to Laguna Beach in 1923. “Doc” Francis Leroy Blacketer was 6, the youngest of 10 children when his parents moved here. Widowed, robust Ida Mole, whose maiden name was Blacketer, was quite a character, who owned a farm on Canyon Acres, Ott said. Mole was married to Orben Mole, called “Stubby” by his neighbors, said Lindsey. “Stubby” could not read or write and signed his name with an X, Lindsey said. He was viewed as a nice guy who gardened and grew crops. Earlier in his childhood Ott and his friends couldn’t wait to come home from school and go to Mole’s house. Ott remembers another exciting aspect of childhood: a rare snowstorm in the late 1940s. The corner where the Hemenway homestead stood later became a hot spot in the ‘70s because of efforts by newspaper publisher Vernon Spitaleri. In 1964 Spitaleri bought South Coast News, the successor to the community’s original publication, Laguna Beach Life, established in 1915. The following year, he bought out the competition, renamed the Laguna Beach News Post. He sold the paper in 1980. “I bought the property on both sides of Canyon Acres,” Spitaleri said. “I bought it specifically to move our newspaper from Forrest Avenue and Glenneyre Street. Spitaleri was pleased with the big lot because the former building also housed the newspaper’s press and he needed a lot of room. He sought an M1A permit as one of the specific uses permitted was for a newspaper. It was not approved. Rather than continuing to fight City Hall, Spitaleri suggested an alternative that he thought would be conducive as live-work spaces for artists. After going through several rounds of reviews, the parties couldn’t work it out and the project ended up in court, he explained. Well known Laguna Beach resident and contractor David Young went to bat for Spitaleri, declaring that the space required at least 12 units to make it economically affordable. The city council voted to allow 11 spaces. Judge Jerry Brown’s ruling favored the city. Spitaleri was defeated again. The whole process took years. He is currently building a house on the Arroyo Drive lot but sold the other. That land became home to what is now called the Art-A-Fair. Artists who were not accepted by the Festival of Arts wanted to start a new art festival. There was dissention among that group, too, which broke into factions known as the Sawdust Art Festival and Art-A-Fair, explained Richard Jenkins, the Art-A-Fair business manger. After a couple of other locations, the Art-A-Fair found its home on Canyon Acres in 1977, near the other festivals. The canyon is rich with unusual stories. 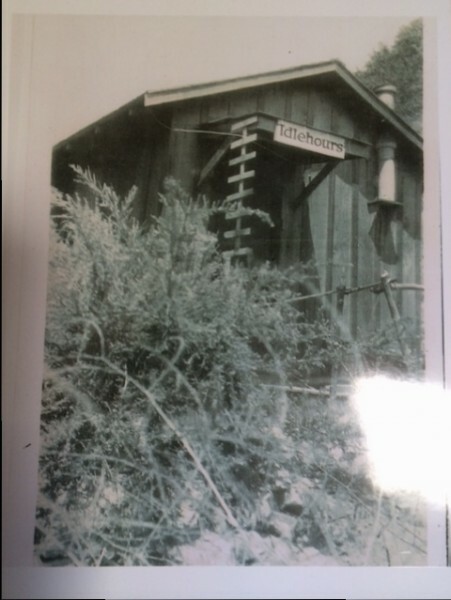 Lippe said during prohibition Canyon Acres was known as Bootlegger’s Canyon for residents who distilled and smuggled booze. Others interested in illicit goods of another sort populated the canyon in the ‘60s and ‘70s. “Stubby told me in the ‘60s Timothy Leary lived all over the neighborhood and in the caves,” Lindsey said. Crops of marijuana were cultivated in the canyon hills, said Arroyo Drive resident Larry White. Bader recalled another unusual incident around circa 1987 or 1988. He calls it the days the cows showed up. Around 5 a.m. while the family was still in bed, they were awakened by police bullhorns, ordering residents “to stay in your house,” Bader said. Cows had escaped from Irvine Ranch and were stampeding up the street. The 90s was an ugly decade for the close-knit community, first decimated by the Oct. 27, 1993 firestorm and four years later by torrential El Nino rains and mud. More than 40 houses burned in Canyon Acres. So did one on Arroyo Drive. At her home, Lynn Lindsey said the only thing that survived the fire was a mailbox. Lindsey said the Good Samaritans of the neighborhood were neighbors Ted and Paula Sorenson. “They lived across the street and offered support to everyone,” Lindsey said. Paula, who has since died, offered food, shelter, a place to wash hands, use the bathroom. She opened her home as a haven to help her displaced neighbors any way she could. The fire also claimed a building used by Ballet Pacifica as its headquarters and costume storage. “They didn’t have the resources to rebuild it,” Spitaleri said. “That’s the reason it was moved out of Laguna,” he said. In one of the heaviest rainfalls on record, El Nino dumped more than six inches of rain on two consecutive days in early December 1997. The closure of Laguna Canyon Road meant residents of Canyon Acres were cut off temporarily. *Special thanks to “Laguna Beach California an Illustrative Narrative History” written by Laguna resident Roger W. Jones, 2003.